I knew him simply as Jim or friend, but back in those days on the old Au Sable in the Jack Pine barrens of Michigan’s Lower Peninsula he was known by some as Bay City Jim. The name came from his place of origin, Bay City, Michigan along the shores of Saginaw Bay. Dressed in his signature felted western hat, khaki-tan shirt, Orvis® Tackle-pac fly vest, carrying his bamboo rod and smoking his Meerschaum pipe he cut a distinctive figure among our band of rag-tag anglers. However, to me he was simply my best friend. Over the years we sat on many streamside logs tinkering with our tackle, watching the water, and exchanging small talk while we waited for the action to start. We sat together in the gathering dark anticipating the sound of a trout slurping down a big Hex mayfly somewhere out there in the darkness. We tied flies together and taught others how to do the same. We filled jars with little bugs that we scooped up from the river, and transported them to his home in Bay City where we kept them alive in several aquariums in his basement. I identified them and he photographed them. Then we tied imitations of them, and fished them on the Au Sable. We shared cold duck blinds together, tramped through the Quaking Aspens in the fall seeking Woodcock and Ruffed Grouse, and the apple orchards of long abandoned farmsteads looking for White-tailed Deer. We trudge together through cedar swamps on snowshoes following cat hounds trying to shoot Bobcats with a bow. In the fall of 1971 we embarked on an odyssey that would forever change both of our lives. Just after Labor Day we pack his station wagon with fly fishing gear, hooked up the camping trailer, and, with another demented soul, struck out for the Rocky Mountains to fish for trout. From Henry’s Fork of the Snake in Idaho to the spring creeks of the Paradise Valley in Montana we spent 10 glorious days fishing some of the most exciting water that we had ever seen. Within 3 years both of our families were living in Montana. Over the intervening years, like two mayflies floating downstream, our lives diverged and converged, but mostly we gradually drifted apart. They lived north of Livingston for several years, and then spent a brief stint in western Montana before leaving the state for the coast of Washington. 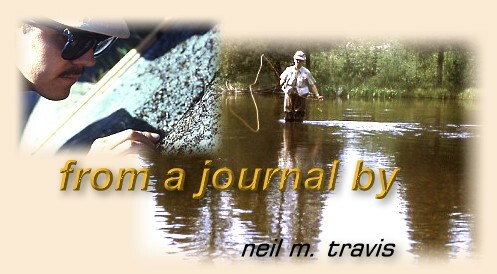 A brief encounter a few years ago at a Federation of Fly Fishers Conclave here in Livingston resurrected our connection, and shortly afterward I began to write a regular column for FAOL. Last fall I wrote Jim a note and spent some time reminiscing about our days on the Au Sable, and asked what he thought about all that had transpired since those days. His response, which is printed below, is the last communication that I had from him. Thanks for the memories old friend. God speed.